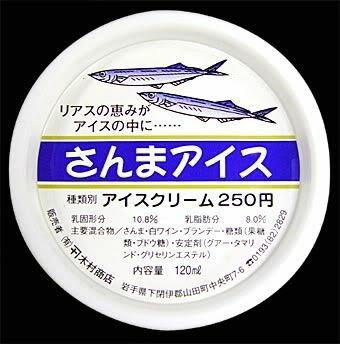 Fish Ice Cream (Sanma Aisu) Something must smell fishy about ice cream flavored with saury, a saltwater fish popular in Japan...But there's no worries about that with this offering from Kimura Shoten as the fishy fumes have been drowned out by liberal doses of brandy. Not the greatest tasting ice cream on earth, though. 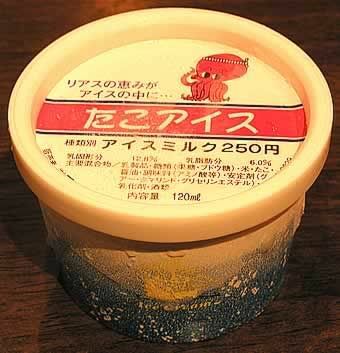 Octopus Ice Cream (Taco Aisu) Want to tantalize the taste buds with a tentacle? If so, Octopus Ice Cream is the go. Japanese have been able to come up with an amazing variety of uses for octopus, ranging from delicacy to p0rn0 movie prop. Little wonder that octopus has found its way into ice cream, then. Eel Ice Cream (Unagi Aisu) Eel is a summer delicacy in Japan, which probably explains why Futaba decided to use it to flavor an ice cream. 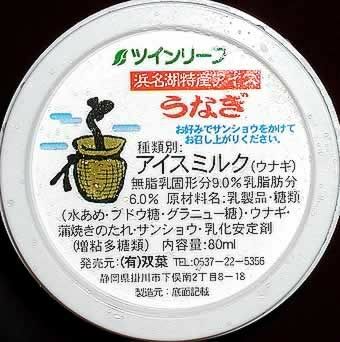 Surprisingly, the smooth taste is quite palatable, even if the thought of what's being eaten is not quite as tasty. You can check out the other flavours here. Well... i'll try if you try! You KNOW I didn't mean it that way!